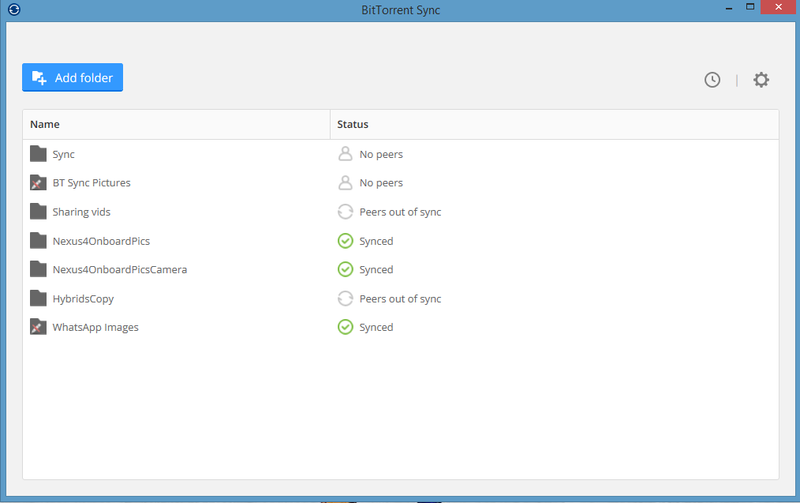 On Tuesday, BitTorrent (the company) launched Sync 1.4, a brand new version of its peer-to-peer file syncing app that makes sharing folders with others a breeze. We have an in-depth hands-on with Sync 1.4 that will teach you how to use the app if you’re not familiar with it. But since this new version means Sync isn’t just for power users anymore, I thought I’d offer three interesting ways you could use the new app to share photos, trade notes, and sync music across all your devices. Just keep in mind two crucial points: any device you’re sharing files with must have Sync 1.4 installed (mobile or PC). Second, both devices must be turned on at the same time for Sync to work since files are not stored on a third-party server (like Google Drive, or Dropbox), but shared between devices over an encrypted peer-to-peer file sharing network. If you don’t want to put your personal photos in the clouds of Dropbox, Facebook, Google, or Microsoft, BitTorrrent Sync 1.4 is an easy alternative. Get started by creating a folder on your PC called Family shared photos, Pics for grandma, or whatever you’d like to call it. Next add it to Sync 1.4 by tapping the blue Add folder button, navigate to your new shared photo folder in the window that opens and then press Select folder. Now that you’ve added your folder to Sync 1.4, you’re ready to share it with others. Just make sure that anyone you share it with has Sync 1.4 installed on their PC, tablet, or smartphone. 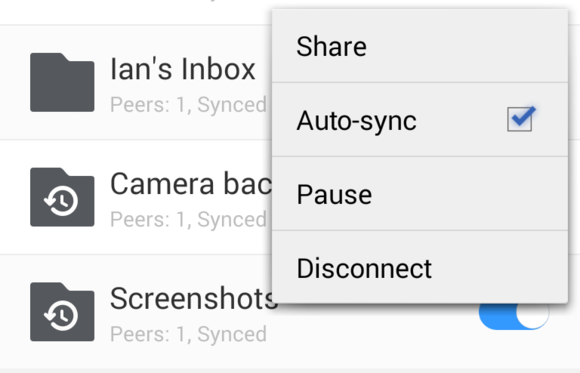 To learn how to share folders in Sync 1.4, check out our hands-on. Once the folder is shared, all you have to do is drop photos into the new folder and your family and friends will receive them automatically. If you are sharing with someone who’s on a tablet or smartphone, keep in mind they’ll have storage constraints so be careful how many photos you share at one time. A quick and simple way to share messages, documents, and random files with others is to set-up a rudimentary messaging system using Sync. Create a folder on your PC called “[Your Name]’s Inbox.” In my case it would be “Ian’s Inbox.” Next, add the folder to Sync and then share that folder with friends and family using read and write permissions (see the hands-on for more details on read & write folders). Once that’s done, Zoe can drop stuff into the copy of “Ian’s Inbox” on her PC such as plain text notes, photos, documents, or whatever, and I can do the same for her. The best part is we’re swapping data without using email. Unlike other services, Sync doesn’t limit file sizes. Just keep in mind that anyone you share your inbox with will have full access to its contents. So if you start trading love notes with Jane, but you’ve also shared the folder with your mom...well, you get the picture. To avoid this problem, you could create multiple folders to share with different people or just stick to trading inbox stuff with a small group of friends. You can also consider using OpenPGP to encrypt the messages and files themselves. There’s an interesting way to get music from your PC to your Android phone if you’re not using Spotify or don’t have your audio collection up in the cloud with Google Music. However, it is a little more complex than the two uses I just explained. To get tunes onto your phone via Sync we have to use a few workarounds, but once it’s set-up, it’s a very simple way to quickly move music to your Android device. First, create a new folder on your PC wherever you’d like. I’d suggest creating a folder such as Users\yourUserName\Music\Music2Phone. Then add it to Sync 1.4 as described under the first tip. Hover over the new music folder in sync and click the share icon and in the window that opens click QR Code. Leave that QR code open, we’ll be coming back to it in a minute. Now fire up your Android phone and download VLC from Google Play. VLC is still in beta, but it’s the easiest way to access music loaded onto your phone via Sync. Open Sync 1.4 on your Android device and tap the menu icon (three vertical dots) in the upper right corner. Tap Settings > Advanced and then uncheck the box that says Simple mode. Once that’s done, go back to the main screen in Sync 1.4 and tap the folder icon with the plus symbol. This will open your camera and you’re ready to scan that QR code we left sitting on your PC display. Diving into the Android file system via Sync 1.4. Once you’re done scanning, Sync 1.4 will ask you to choose a folder location on your Android device—because we turned off simple mode earlier. We want to save it in your phone’s default music folder by tapping the Select folder button and navigating to Device storage > Music. Android phones can sometimes differ, but you should be able to navigate to something similar in your file system. Next, tap Choose folder then Add folder and that’s it. The Music folder should now appear on the main screen on Sync 1.4 for Android. Any music in the folder on your PC should now start syncing to your Android device automatically and will be available in VLC for Android. Anytime you want to add music to your device just drop it in that folder on your PC. 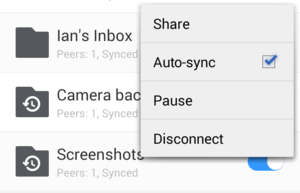 Make sure the Auto-sync box is checked on your Android device to sync files automatically. If the folder on your phone doesn’t sync automatically, tap the menu icon next to the Music folder and in the drop down menu that appears make sure the Auto-sync box is checked. As a final step, return to your main screen and go back to Settings>Advanced and turn on simple mode again. That’s definitely a setting you want to have turned on most of the time so that you don’t have to choose where new Sync folders are stored on your Android device. 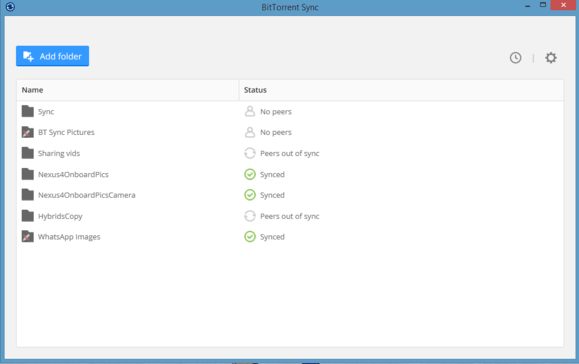 BitTorrent Sync has come a long way since it was introduced in early 2013, and is a great way to sync files across your devices automatically—especially if you’re souring on third-party cloud storage services.